Protected natural areas have historically been the primary tool of conservationists to conserve land and wildlife. These parks and reserves are set apart to forever remain in contrast to those places where human activities, technologies, and developments prevail. But even as the biodiversity crisis accelerates, a growing number of voices are suggesting that protected areas are passé. Conservation, they argue, should instead focus on lands managed for human use—working landscapes—and abandon the goal of preventing human-caused extinctions in favor of maintaining ecosystem services to support people. If such arguments take hold, we risk losing support for the unique qualities and values of wild, undeveloped nature. Protecting the Wild offers a spirited argument for the robust protection of the natural world. In it, experts from five continents reaffirm that parks, wilderness areas, and other reserves are an indispensable—albeit insufficient—means to sustain species, subspecies, key habitats, ecological processes, and evolutionary potential. Using case studies from around the globe, they present evidence that terrestrial and marine protected areas are crucial for biodiversity and human well-being alike, vital to countering anthropogenic extinctions and climate change. A companion volume to Keeping the Wild: Against the Domestication of Earth, Protecting the Wild provides a necessary addition to the conversation about the future of conservation in the so-called Anthropocene, one that will be useful for academics, policymakers, and conservation practitioners at all levels, from local land trusts to international NGOs. "This in-depth analysis of environmental conservation shows how seeking new responses to decreasing biodiversity can offer hope. 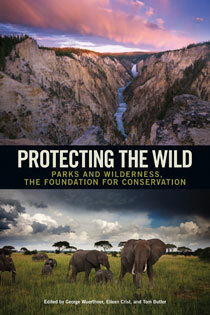 ...a powerful collection"
"Protecting the Wild is a monument." "...inspiring...gives conservation a positive vision of the future." "[Protecting the Wild is] a powerful and impassioned push-back to what is becoming a kind of conventional wisdom among a certain clique of environmentalists." "Protecting the Wild is an ambitious, passionate plea in support of a worthy effort." "A stellar collection of essays that...seeks to reaffirm and update conservation's traditional commitment to preserving nature." "Everything we have, need, use, or want comes from nature. Protecting the Wild is a powerful and urgent reminder that we must enlarge protected areas and connect them, as well as manage the surrounding landscape for conservation, to assure the survival of all forms of life, our own included, on this beautiful planet."